Carte du Canada ou de la Nouvelle France & des decouvertes qui y ont ete faites dressee sur les observations les plus nouvelles & sur divers memoires tant manuscrits qu’imprimez. This folio map south the topography around the Great Lakes in North America. The text book in the top left coner details the history of the discoveries in this region. Apart from the topographical details the map is filled with explanatory notes including one that mentions the river Lonque having been discovered by Lahotan. This fictitious river is shown with its source in the Rocky mountains and running east and south, joining the Mississippi. The early settlements of Detroit and Chicago are also shown. Publication: Atlas Historique, ou nouvelle introduction a l’histoire, a la chronologie & a la geographie ancienne & moderne. A Amersterdam, chez L’Hoinore & Chatelain Libraires. Cartographer: Henri Abraham Chatelain (1684 – 1743) was a Huguenot pastor of Parisian origins. He lived consecutively in Paris, St. 1710, The Hague c. 1721 and Amsterdam c. He is best known as a Dutch cartographer and more specifically for his cartographic contribution in the seminal seven volume Atlas Historique, published in Amsterdam between 1705 and 1720. Innovative for its time, the Atlas Historique combined fine engraving and artwork with scholarly studies of geography, history, ethnology, heraldry, and cosmography. Some scholarship suggests that the Atlas Historique was not exclusively compiled by Henri Chatelain, as is commonly believed, but rather was a family enterprise involving Henri, his father Zacharie d. 1723 and his brother, also Zacharie (1690 1754). They worked as a partnership publishing the Atlas under several different Chatelain imprints, depending on the Chatelain family partnerships at the time of publication. The atlas was published in seven volumes between 1705 and 1720, with a second edition appearing in 1732. The maps were accompanied by information pertaining to cosmography, geography, history, chronology, genealogy, topography, heraldry, and costume of the world. The images incorporated into the plates and tables were drawn from the best available contemporary sources, including the works of Dapper, Chardin, de Bruyn and Le Hay. Many of the maps are based on the work of Guillaume de l’Lisle. The sheet is evenly aged toned, commensurate with its age. If there are minor tears they have been mended with archival tissue. The attached photo is part of the item description, please examine carefully. Size (h x w): 44.0 x 52.5 cm. 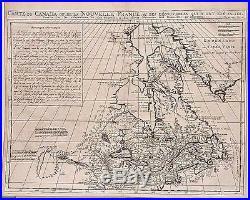 The item “Antique map, Carte du Canada ou de la Nouvelle France” is in sale since Friday, April 24, 2015. This item is in the category “Antiques\Maps, Atlases & Globes\North America Maps”. The seller is “boden_antique_maps” and is located in Chichester. This item can be shipped worldwide.